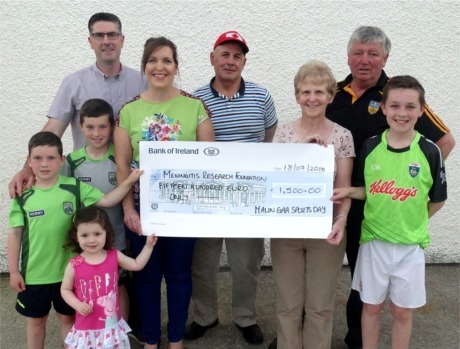 MENINGITIS Research Foundation has thanked Malin GAA for choosing it as one of their beneficiary charities during the club's recent Annual Sports Day. The fundraiser was a great success with races and family fun day raising €1,500 for the foundation. Kathleen Doherty accepting the cheque on behalf of the Meningitis Research Foundation pictured with Kevin and Catherine McGeoghegan with their children Ryan, Thomas, Shay and Eimear. Shay suffered from meningitis but is now well on the road to recovery. Also pictured is Paddy McLaughlin and John Byrne (treasurer). There are an average of 200 cases of bacterial meningitis and septicaemia- the blood poisoning form of the disease in Ireland every year. Figures from the organisation show that one-in-ten of those who contract the disease will die while one-in-three survivors will be left with life-changing after-effects such as limb amputation, brain damage or deafness. A spokesperson for the charity said: "Money raised from this (Malin) event will help to fund research into the prevention, detection and treatment of meningitis and septicaemia and raise awareness of the diseases amongst both the general public and health professionals in a greater Donegal area. It will also contribute to our freefone helpline service that operates 365 days a year and other support services available for local people affected by meningitis." Meningitis Research Foundation is a non-government funded organisation that relies on the generosity of local communities and fundraising events and donations to continue its vital work "so the charity is extremely grateful to Malin GAA for organising this event", the spokesperson added. The second beneficiary - which also received €1,500 from Malin GAA - was the Jack & Jill Foundation which supports families of children with brain damage and intellectual disability.